Folders on your iPhone give you the option of putting like-minded apps together in one place so you can find them quickly and easily. Think of folders as a way to organize your iPhone Home screen. You can organize directly on iPhone or use iTunes. Touch and drag one app button over another app button. A square appears around both apps. Tap anywhere on the screen outside of the folder. (Optional) Touch and drag another app into the folder. Tap the Home button to save the folder and stop the app dance. If a folder has already been created but you want to add apps to it, press and hold an app to make them wiggle and then drag the app you want into the folder. 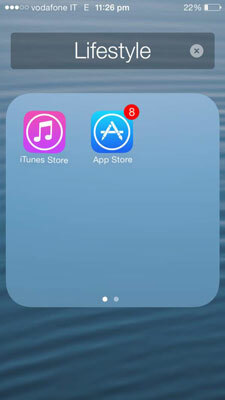 To remove apps, while the apps are wiggling, tap the folder you want to change to open it. Drag apps out of the folder onto the Home screen. A folder is automatically deleted when all apps are moved out and it’s empty. Press and hold an app on the Home screen. Tap the wiggling folder whose name you want to edit. Tap the circled X on the right of the field where the name is written. The field is erased. A cursor appears at the beginning of the field and the keyboard opens. Tap out the name you wish to give this folder. Tap the Done key on the bottom right of the keyboard. Tap outside the folder to close it. The buttons are still wiggling. Tap the Home button to save the renamed folder. When you have a lot of apps and folders, moving them around from screen to screen can be tedious. 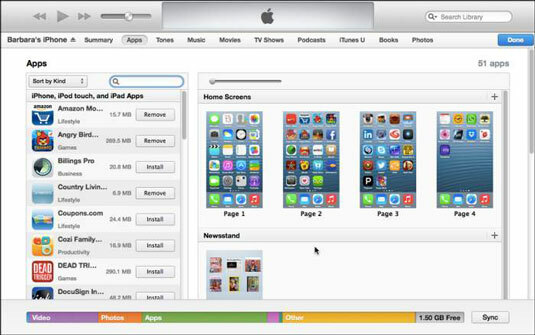 Luckily, you can also organize your Home screens, apps, and folders in iTunes. Connect your iPhone to your computer with the USB connector cable, select your iPhone and then Apps. Drag an app from the list to the Home screen or folder where you want it to reside and it moves from its old location to the new one. You can even move an entire Home screen to a new position in the lineup or add a blank Home screen — and you can do those maneuvers only in iTunes. After you make your changes and the Home screens are organized just the way you like, click the Sync button to sync your changes with your iPhone.